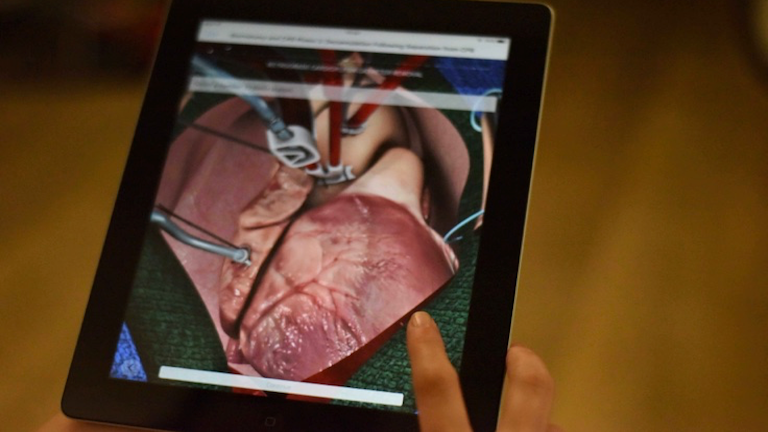 The mobile surgical simulation app Touch Surgery is getting AR functionality to allow surgeons greater assistance when performing medical procedures. At CES 2017, Touch Surgery announced their partnership with DAQRI, an AR headset that’s endeavouring to bring Augmented reality to the operating room. It’s frequently discussed how surgeons have no place to practise an operation and that, when they are performing on a patient, it’s sometimes their first time performing that particular piece of surgery. When Touch Surgery was originally released as an app in 2014 it built up a great reputation for helping surgeons familiarise themselves with how an operation works before they go in to the operating room and perform. The app digitised over 225 operating procedures from neurosurgery to brain surgery and reached over 1.5 million downloads. Now the company is looking to funnel all of this success into an experience they hope is going to be adopted by doctors globally. Whereas the old application would generate a patient for you to operate on using the touchscreen, the AR version with DAQRI is designed for use in the operating room where the headset will display where they’ll need to make incisions for instance. The prospect of a surgeon operating on you wearing an augmented reality headset seems extremely futuristic. The technology is meant to help reduce the number of human errors that are made during important procedures. Touch Surgery has been aggressively hiring new employees to help with research and development to help bring this product to market as soon as possible. Would you feel comfortable with a surgeon operating with an AR headset, or would it make you slightly wary of the fact he may not completely know what he’s doing? Let us know in the comments below.